Since our 2018 Silent Arctic Expedition, we have been working hard, devising an even greater adventure. Now, we are pleased to announce Silent Arctic 2019, which builds on the previous expedition, but adds both more luxury as well as your own fine art print at the end of the workshop! BRACE YOURSELVES, THIS IS THE WORKSHOP FOR THE AGES! 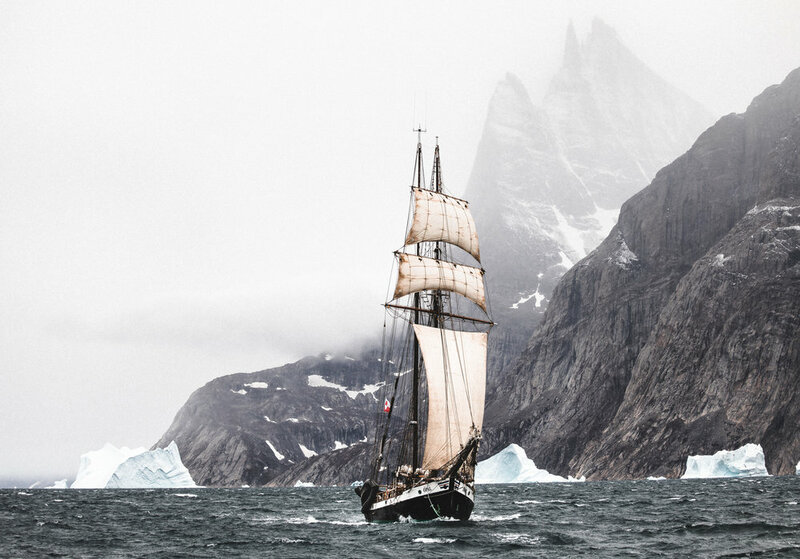 This is nothing short of a full-scale expedition in Northeast via electric schooner along the east coast of Greenland and into the world's largest fjord system, some of which are nearly 150 miles in length. Here, the photography opportunities are endless as we lose ourselves in this epic world of ice and immense scales: a landscape whose wonder reaches far beyond the limits of our imaginations. Having so many new things with so many new people creates very powerful bonds between everyone involved, forming powerful and lasting friendships. Below, previous workshop participants reflect on the experiences that the workshop left on them. — Mia Nguyen, participant on the Melrakki Arctic Fox Workshop in Iceland's Westfjords, Nov. 2017. In a world where we are constantly at the mercy of the notification, the next bite-sized piece of information, it is easy to forget what it means to switch off. 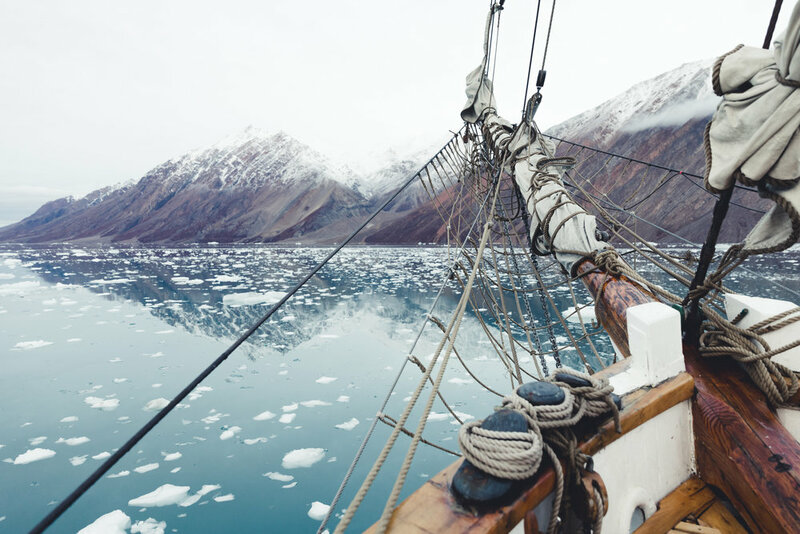 On board our glorious schooner in depths of the High Arctic, we will be humbled by a true sense of disconnection form the outside world. This is silence, through and through. The photographic potential in this wondrous landscape is infinite. Think ice, ice that is taller than buildings, larger than city blocks, towering above and around us as we sail and move silently between them. Walls of mountains stretching through vast U-shaped valleys where rivers of ice once lay. High above the Arctic Circle and aided by 16 hours of late summer daylight, the potential to photograph stretches well beyond just landscape photography. Tiny, remote villages buried away in places you never thought possible. 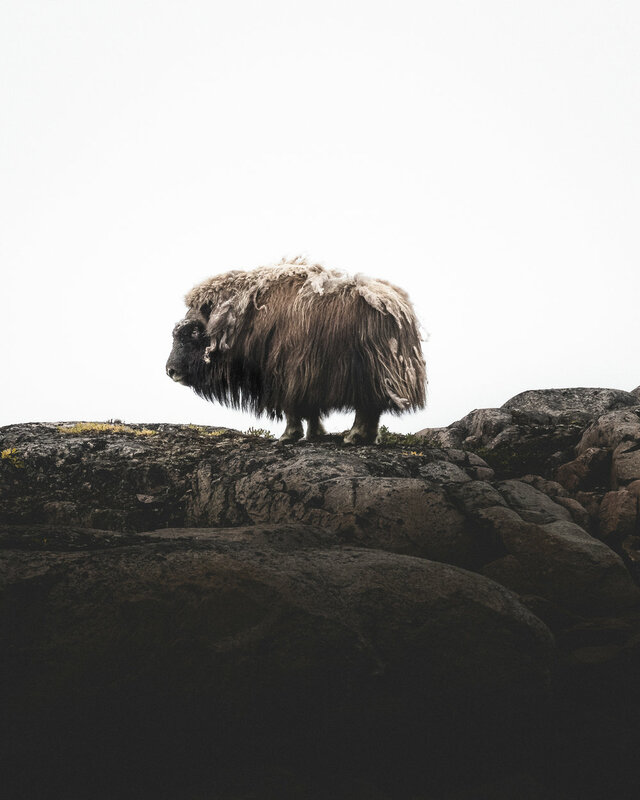 The majestic Ummimak, or Musk Ox and other forms of Arctic Life will be accessible from the vessel as we embark on a journey which goes far beyond your average photography workshop. There is a small chance of Northern Lights at the time of the year in Greenland since there is a brief window of darkness, although not guaranteed. If we were to see the lights it would indeed by splendid. 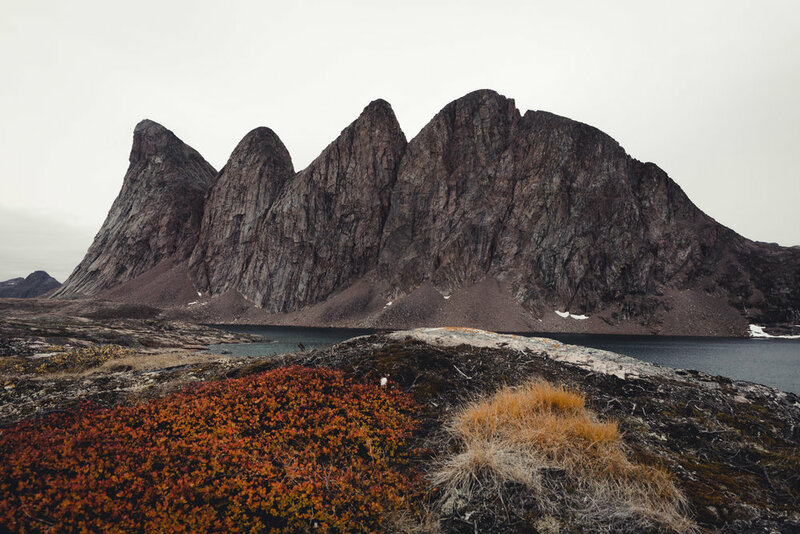 More incredible locations on the Northeast Greenland Coast. The world's most Nothern capital. A hotbed of art, music and culture. We meet here, and then venture forth. Population: 468. This is the only permanent settlement in the region, and is well within the southern limit of the High Arctic tundra and the Polar Barrens, in the Sermersooq municipality in eastern Greenland. Here is a tiny airport named Constable Point which employs just 15 people. It is located on Jameson Land and serves the town of Ittoqqortoormiit. This is one of the world's most isolated airports. It is from here that we land and transfer to our vessel. Named after the adventurer and explorer, William Scoresby who mapped the fjord area in detail in 1822, Scoresby Sund is a labyrinth of U-shaped glaciated valleys. Long gone millions of years ago, the glacier leaves behind the world's largest fjord system, Scorsby Sound. Here, in the High Arctic, we find one of the most remote areas of the planet. It is difficult to picture or imagine a place more vast, barren and untamed such as this. Scorsby Sound covers an area of about 38,000 km2(14,700 sq mi). The longest of the fjords extends 340–350 km (210-216 mi) inland from the coastline. The depth is 400–600 m (1,310-1,970 ft) in the main basin, but depths increase to up to 1,450 m (4,760 ft) in some fjords. It is one of the largest and longest fjord systems in the world. Schooners are fabled for the ability to sail silently through the seas. Usually however, schooners cary a backup diesel motor for more precise manoeuvring. However, Opal has state-of-the-art technology: it is a schooner with an electric motor. Result? A blissfully silent experience form beginning to end. The Opal Schooner is provided by our incredible partners North Sailing. This two-masted schooner has sailed all over the world, completing several trans-Atlantic crossings, being carefully maintained through the years. Opal joined North Sailing´s fleet in early 2013 and has since undergone restoration and had interior work done to better fit her for the new purpose as an expedition ship. Image courtesy of North Sailing. Silent Arctic is open to 10 wildlife, adventure and photography enthusiasts. We will focus on capturing the dramatic, humbling landscapes that surround us in these epic, barely-visited locations. Joe and I will be providing a very small group experience, limited to just 10 participants. This means that we will be able to focus our attention and expertise on technique and locations, thereby making sure that our participants get the right shots. A Londoner by birth, Joe originally came to live in Iceland in for University, not knowing what lay ahead. He then discovered Iceland's remarkable landscape. Through the lens and many years of exploration, Joe connected with the landscape in a profound way, and now uses his expertise to help others to discover their own connections. Below is an overview of the high level itinerary. In addition to this, we will incorporate excursions to hopefully sight whales as well as more surprise elements! This is not just your standard itinerary, we will be pushing the crew hard as well as you guys to seek the ultimate adventure and maximise our photographic potential. AM MEET AT REYKJAVIK DOMESTIC AIRPORT. THIS IS VERY CLOSE TO THE CENTER OF REYKJAVIK AND NOT TO BE CONFUSED WITH KEFLAVIK INTERNATIONAL AIRPORT. REYKJAVÍ­K FOR A TRANSFER FLIGHT TO CONSTABLE POINT IN GREENLAND. POSSIBLE SECRET WILDLIFE EXCURSION (WEATHER DEPENDENT). BOARD OPAL AND GET AN INTRODUCTION AND A SAFETY BRIEFING BY THE CREW BEFORE SAILING TOWARDS THE VILLAGE OF ITTOQQORTOORMIIT, ONE OF THE WORLD’S MOST ISOLATED VILLAGES. THE QUAINT LITTLE HOUSES DOT THE ROCKY SLOPES OF SOUTH LIVERPOOL LAND WITH MAGNIFICENT VIEWS OF KAP BREWSTER AND THE VOLQUART BOONS COAST TO THE SOUTH. WE ANCHOR AT HEKLA HAVN, ON DENMARK Ø, THE SITE OF AN OLD INUIT SETTLEMENT. SAIL WEST THROUGH THE NARROW FØHNFJORD WITH THE BASALT MOUNTAINS OF GÅSELAND ON THE PORT SIDE AND 2000 METERS HIGH SHEER GRANITE CLIFFS OF MILNE LAND ON THE STARBOARD SIDE. ARRIVE IN HAREFJORD IN THE LATE AFTERNOON WHERE ANCHORS ARE SET. SPEND THE WHOLE DAY ON THE SOUTH FACING SLOPES OF HAREFJORD SCOUTING FOR MUSKOXEN, SNOW HARES, GROUSE, GEESE AND OTHER WILDLIFE WHICH NORMALLY GRAZE ON THE SOUTH-FACING SLOPES. INFINITE EXPLORATION AWAITS, A SHORT ZODIAC RIDE AWAY. IF CONDITIONS AND TIME ALLOW, WE WILL TEND A COZY ARCTIC BONFIRE ON THE BEACH. SAILING CONTINUES ON DAY 5 HEADING DEEPER AND EASTWARDS THROUGH THE AWESOME ØFJORD, POSSIBLY THE HIGHLIGHT OF THE TRIP. SET ANCHORS IN JYTTES HAVN IN THE LATE AFTERNOON. 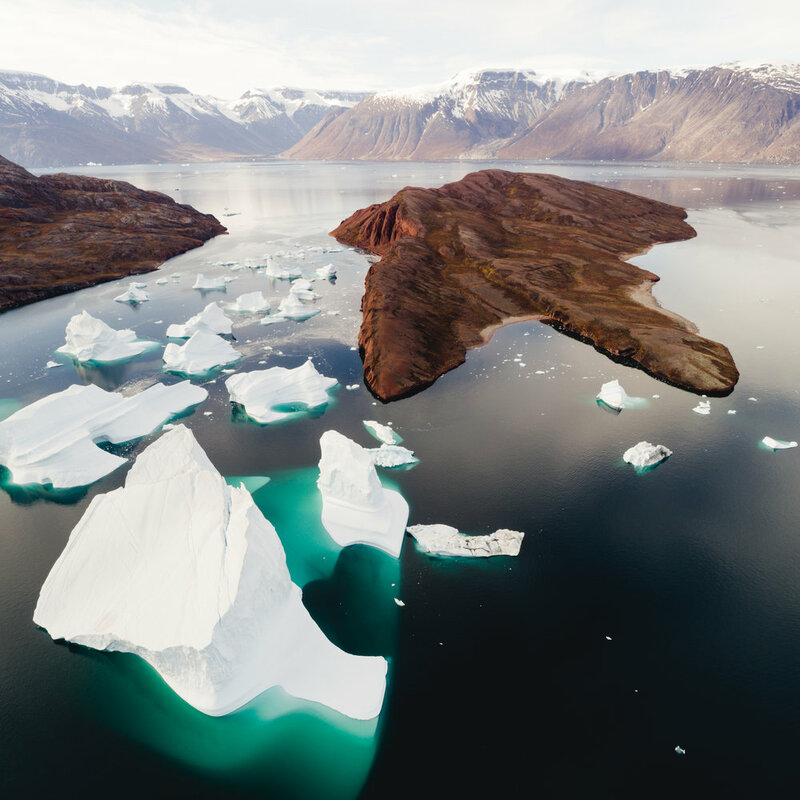 DISEMBARK THE SAILBOAT FOR THE LAST TIME AND BOARD THE AIRCRAFT AT CONSTABLE POINT AND FLY BACK TO REYKJAVÍK, ICELAND, THE ADVENTURES OF THE EXPEDITION BEGIN TO SINK IN AND YOUR LIFE AFTER GREENLAND BEGINS. SAILING THE CHANNEL BETWEEN THE BEAR ISLANDS AND MILNE LAND WITH A BREATHTAKING VIEW OF THE SPECTACULAR ARCHIPELAGO. WHEN WE WAKE UP THE NEXT MORNING, WE ARE ANCHORED AT THE AT THE AIRSTRIP IN CONSTABLE POINT. Your flights to- and from- Iceland. Personal travel insurance, including camera gear. Miscellaneous gear that you might need for the workshop. 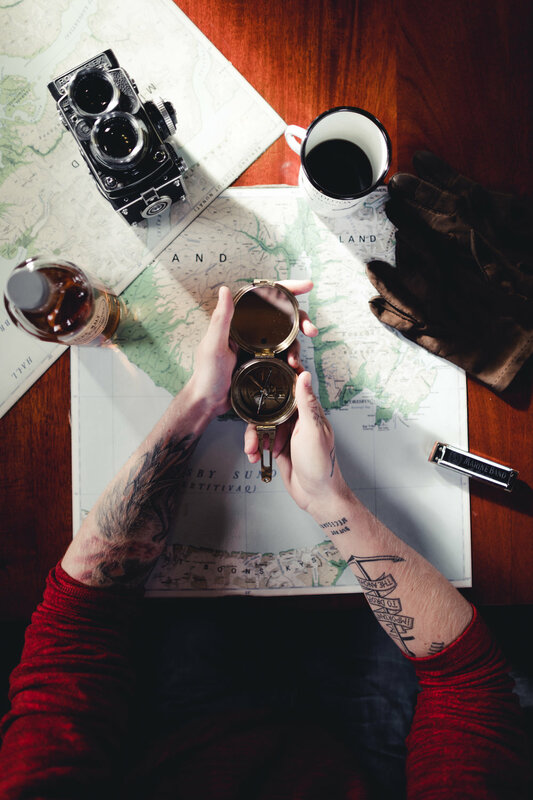 Make sure you are well-equipped for the Greenlandic climate, it can be very temperamental. See below for more queries and questions. We highly recommend that all participants have separate camera insurance for their gear. We also recommend that this insurance includes the use of a courtesy body and lens. 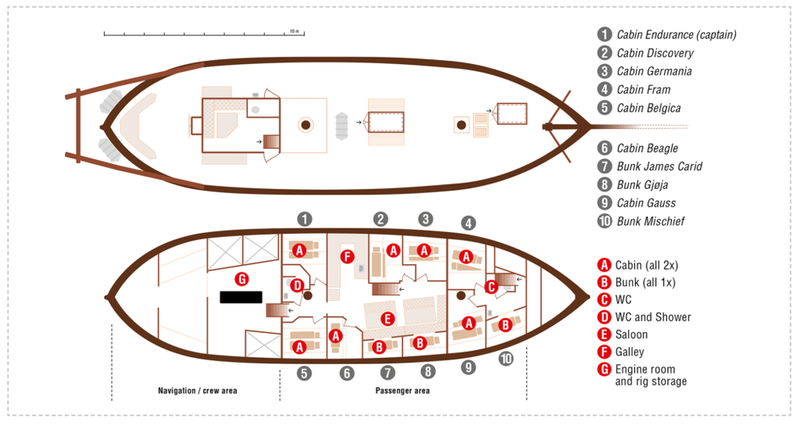 All Accommodation aboard Opal vessel for the entire 7 nights, 8 days. Additional guided expeditions to the shore via Zodiac. 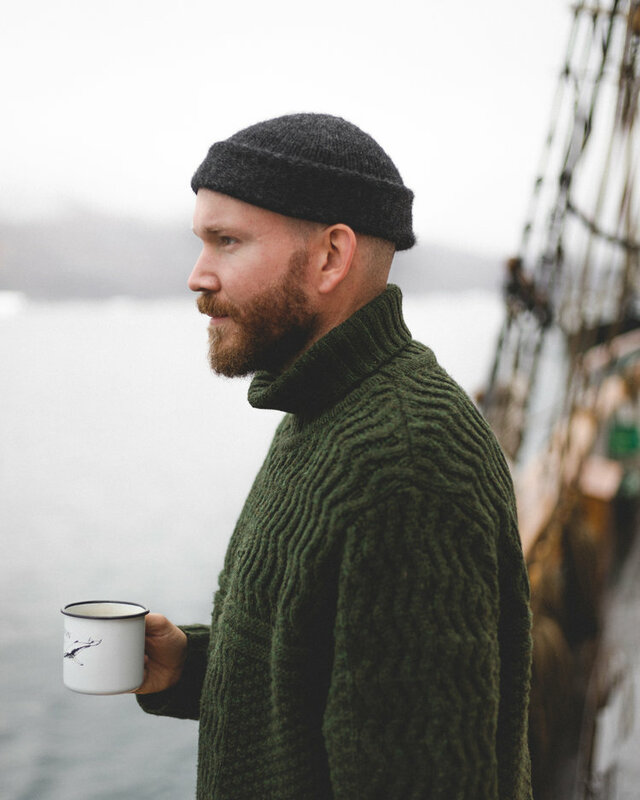 Warm overalls when out to sea and in the fjords. Aerial Photography at every opportunity. Editing and post-production workflow advice from beginning-to-end. Social media advice and assistance. Access to the greatest hidden gems of the High Arctic, seen by very, very few. WHAT LEVEL OF PHOTOGRAPHY DO WE REQUIRE? We welcome all levels of photography expertise. What we want to see is that you love photography and want to learn more, push it, take it to the next level, and take in the atmosphere and experience of working with other creatives in an epic context. There will be some hiking once we set foot on shore form the vessel, so you need to be prepared for this, but in general there won't be much hiking on this workshop. SHOULD I BRING A DRONE? If you have one, absolutely! If you don't, consider getting one! Greenland is a fantastic location to drone. Of course, we won't be doing any droning too close to sensitive wildlife since we to be as respectful of the environment and animal life as possible. HOW MUCH CAMERA GEAR CAN I BRING? Our greatest recommendation in this regard is that you bring a telephoto lens to mix things up (since we will be doing a lot of photography from the boat this will allow you to mix things up). This is especially important for the wildlife photography part. Canon has a superb 100-400mm which would be invaluable. Nikon also also have a brand new 200-500mm and an 80-400mm. Slighly pricier is the 200-400mm but this is a faster lens at f4. That being said, bring what you have. In general, consider bringing a range of focal lengths: wide-angle (e.g, 24mm) standard (e.g, 50mm) and a telephoto (e.g, 85mm or above). A large part of the workshop will be about making the most out of the equipment that you already have. WHAT OTHER EQUIPMENT DO I NEED NO BRING? Down coat to spend long periods outside and in comfort. Greenland is cold as it is, so you can imagine how it will be at sea! Good, sturdy, ankle-or-above hiking boots. Waterproof coat (GORE-TEX or similar). Backpack to carry your gear and other things you might need during the day. All meals are included on board Schooner Opal, and provided by North Sailing, our partner in this charter. The chef is a good friend of mine and food will will be amazing. I'M A VEGETARIAN, WHAT SHOULD I DO? Let us know! I't won't be a problem at all, but it is something that we need to know in advance. If it's dark and it is clear and we are a bit lucky then yes! HOW WILL THE WEATHER BE IN GREENLAND? The Greenlandic climate varies considerably, on a season-to-season and year-to-year basis. Having said that, the temperatures will range between from -5 to +5 celcius throughout the day and nights. Normally the weather is quite calm and sunny but can change really quickly. Especially since we are in the end of the season - which also means we are more likely to get moody and dramatic weather. SILENT ARCTIC, OUR GREAT ADVENTURE YET, HAS VERY LIMITED PLACES. BOOKING ONCE THE VESSEL IS FULL. Terms and conditions of this Expedition can be found here.